Don't miss this tour if you have the skills to complete it; you will be treated to outrageous panoramas from Matrimony Ridge. The most striking view, though there are many, is to the east of Devils Peak. 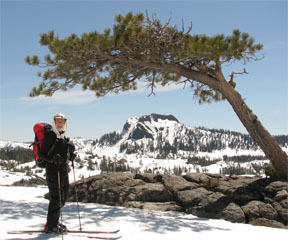 Pick the right angle and you can frame the peak under the weathered Jeffrey pine that adorns Peak 7000 on the ridge. 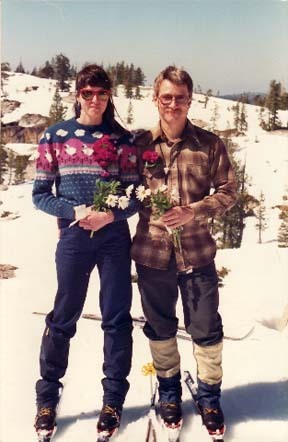 Locals refer to it as the Matrimony Tree because Randy Koerber and Judy Netherwood exchanged vows there on the first day of spring in 1988. 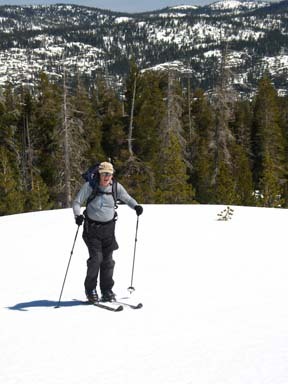 A little more than a mile of this tour follows the High Loch Leven Lake Trail, established in 1991 by volunteers of the Nordic Voice, predecessor of Snowlands Network. The marked trail makes the navigation easier, but you will still need to look carefully for each successive trail marker and refer to your topo map to navigate parts of the route. About a half-mile of the route has been over-grown with saplings and they have reached a size that makes travel difficult without considerable snow. For that reason, the stated season for the tour begins in January. The tour to Peak 6893 is an excellent extension of this tour. Matrimony Ridge is also part of the loop described in the Fisher Lake Overlook tour. After crossing the tracks, locate the extension of the road on which you have been skiing. It is marked with a sign indicating the start of the High Loch Leven Lake Trail. 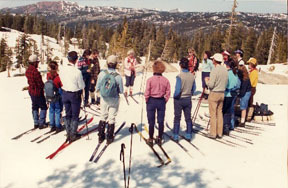 That ski trail is described in the High Loch Leven Lake tour. 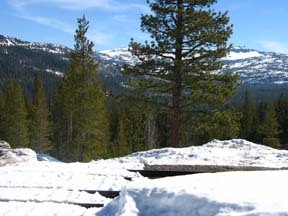 Ski southwest, at first on either the marked trail or the re-aligned road and then on their combination for a total of 0.2 mile until you reach an obscure road junction (4). The junction is located approximately 100 feet before the sign indicating that you should turn right. Leave the road and follow the marked trail southwest and then south for a total of 0.7 mile until you reach more open terrain (9). Waypoints 6, 7 and 8 in this section are provided as additional help in following the marked trail if you are using a GPS. Ski south up broad Matrimony Ridge for 0.2 mile until you reach Peak 7000 (10), the highest point on the ridge. Retrace the route for 2.1 miles back to the trailhead (1).